In a photo taken at last year's U.N. General Assembly in New York, Japanese Prime Minister Shinzo Abe speaks at a luncheon with President Donald Trump and South Korean President Moon Jae-in at the Palace Hotel. 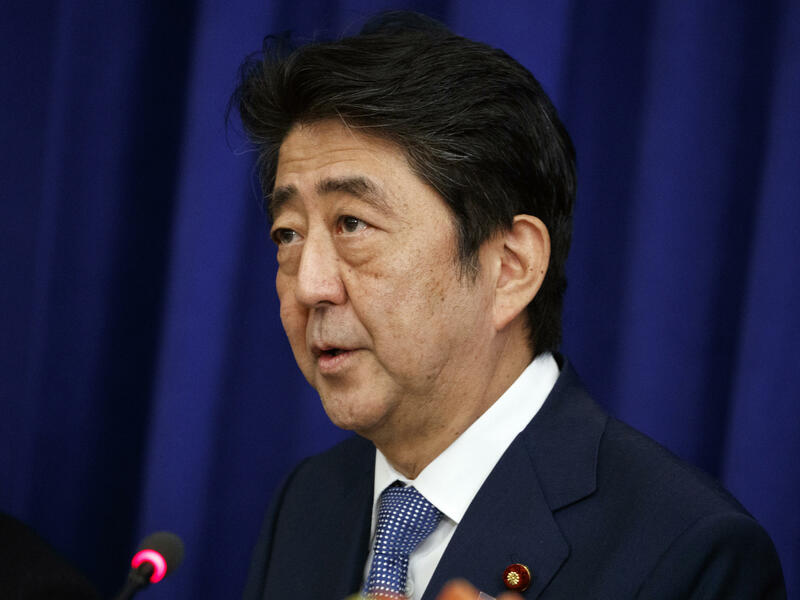 "We agreed to make the momentum created in the historic U.S.-North Korea summit in June even stronger and to continue to coordinate closely toward the denuclearization of the Korean Peninsula," Abe said. Trump tweeted later that he had also invited Abe to dine at Trump Tower again on Monday. In an earlier tweet, Trump wrote, "We have done much to help Japan, would like to see more of a reciprocal relationship. It will all work out!" Trump's meeting with Abe — who has worked to forge a good relationship with the president — comes as the president has threatened to impose a 25 percent tariff on imported automobiles, a move that would hit Japan especially hard. Japan's economy and trade minister, Hiroshige Seko, has said that Tokyo could impose its own tariffs on U.S. goods. "Abe and Trump have built a rapport, but uncertainty remains over whether the Japanese leader can use it to leverage trade issues. Washington seeks a bilateral deal to correct what Trump sees as a trade imbalance between the two nations. Japanese economic revitalization minister Toshimitsu Motegi and U.S. Trade Representative Robert Lighthizer were to meet Monday in New York to lay the groundwork for [an] Abe-Trump summit." Trump's desire for a more "reciprocal relationship" with Japan fits in with his "America First" doctrine, which he is likely to be a highlight of his speech before the General Assembly. At last year's session, Trump laid into North Korean leader Kim Jong Un, calling him "Rocket Man," criticized the Iran nuclear deal and decried that the U.S. pays a greater share of the U.N. budget than other countries. In a video message this weekend, the president said "It's always been surprising" to him that at the U.N. General Assembly "more things aren't resolved, because you have all of these countries getting together in one location but it doesn't seem to get there. I think it will." Washington's ambassador to the U.N., Nikki Haley, told reporters Sunday that Trump's focus "will be very much on the United States." As The Associated Press notes, "Scores of world leaders, even those representing America's closest friends, remain wary of Trump. In the 12 months since his last visit to the U.N., the president has jolted the global status quo by pulling out of the Iran nuclear deal, starting trade conflicts with China and the West and embracing Russia's Vladimir Putin even as the investigation into the U.S. president's ties to Moscow moves closer to the Oval Office."